The Samsung Galaxy Tab 10.1 retail package hardly brings any surprises. The box holds the device, a USB cable, a two-piece wall-mount plug and a pair of headphones. The package is about identical to what you get with most other tablets out there with the headphones not even present everywhere, so we won't be deducting any points of the Galaxy Tab 10.1 here. The tablet is impressively slim and deliberately underdesigned. A certain litigant-happy competitor did vehemently disagree on the latter but to no avail. In tablets, design is minimalist bordering on non-existent. They all look alike. It's not the XOOM, the Flyer, or the Playbook that were in trouble though and we can see a point there. Yes, the Samsung Galaxy Tab 10.1 looks like the iPad2. In a good way or a bad way? You decide. Certainly not in an illegal way. What's ultimately important though is that the Galaxy Tab looks good, and being slim is a big part of that. We do like premium materials like steel, aluminum and the likes but choosing plastic instead saves a whole lot of weight. This is one of the most important things when considering the purchase of a slate - you wouldn't want your hands to go numb when hodling it. The larger 10.1 Galaxy Tab is a good 35 grams below the 600 mark. Its nearest competitor, the Apple iPad 2, is 42 grams heavier. We have to admit, though that the iPad 2 does have a minor edge in terms of overall feel. The Galaxy Tab strikes back with its easier handling due to its taller and slimmer body. Just bear in mind that all that shedding of grams and millimeters hasn't made the Galaxy Tab 10.1 the friendliest of gadgets. Yes, it's portable - impressively so for its screen size - but you'll still need a place to prop it up when your hands need a break. 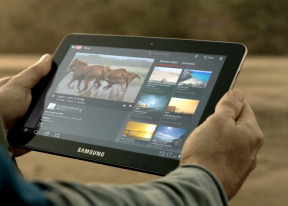 The Samsung Galaxy Tab 10.1 is built around a 10.1” PLS LCD screen with a resolution of 1280 x 800 pixels. The image quality and viewing angles make it one of the best screens to find on a slate. We do like the smaller Galaxy Tab 8.9 screen better, but that's down to the higher pixel density. We were pleasantly surprised to find that both tablets are readily usable outdoors, even if colors do get a bit washed out. Anyway, we're still at a point where being able to see anything on a tablet screen outdoors is considered a great achievement (and we'll probably stay there until the Galaxy Tab 7.7 finally hits the shelves), so the Galaxy Tab 10.1 is almost as good as it gets. The front of the Samsung Galaxy Tab 10.1 has no hardware controls whatsoever – with the Honeycomb OS based solely on touch controls, the slate just doesn’t need them. All you get is the front-facing camera, embedded in the bezel. At the top we find the 3.5mm audio jack and the SIM card slot. The SIM card sinks quite deep and is a bit tricky to push and eject but that's not something you'll need to do daily. The top is the only part of the device to feature any kind of hardware controls with the volume rocker and the power key near the left corner. Moving on to the bottom, the Samsung Galaxy Tab 10.1 uses a proprietary 30-pin connector for charging and connectivity. Both the USB host and HDMI TV out require adapters to work and at this point we cannot confirm any of them will be part of the standard package. An SD card reader is another optional accessory which will probably have to be purchased separately. Be warned that you'll need a power cable to use the HDMI TV-out. Aesthetically, a single connectivity port is the preferred solution - and the Galaxy Tab 10.1 has the functionality after all - you'll just need to get the adaptors. To be fair to the competition though, they have the connectivity features available straight out of the box. The Motorola XOOM comes with dedicated microUSB and HDMI ports, along with a microSD card slot (fully enabled at last). The HTC Flyer has a microUSB port and a memory card slot, too. The other thing to note at the bottom is the microphone pinhole. The Galaxy Tab 10.1 doesn’t have telephony enabled, but the mic is needed in voice and video chat. There are a bunch of Android apps that offer that kind of functionality. The two short sides of the slate (left and right when you hold it in its default landscape orientation) have nothing but a speaker each. The placement of the stereo speakers on the opposing sides seems the better solution than what we saw on the Galaxy Tab 8.9, where they were right next to each other. The journey ends at the back of the Samsung Galaxy Tab 10.1, which features the 3.15 megapixel camera lens and its LED flash. The flash will probably make better use as a torch than provide serious shooting assistance. Then again, nobody buys a tablet for its imaging capabilities. The Samsung Galaxy Tab 10.1 3G is powered by a 7000 mAh Li-Po battery, which Samsung say should keep it going for 9 hours straight. We can't complain about the battery life the tablet gave us in our test. Used occasionally on normal daily tasks, the Samsung Galaxy Tab 10.1 can easily last 3 days. On a fully charged battery, we surfed the web for a couple of hours via Wi-Fi, played a few games, watched videos and installed apps, all the while testing the tablet for our review and the charge dropped below 50% in the evening. We guess you can easily get a full day out of the Galaxy Tab 10.1 no matter how hard you push it, which is not bad at all. Let's briefly look at the accessories available for the Galaxy Tab 10.1. The keyboard dock is pretty convenient packing a lot of hardware shortcuts and allowing comfortable two hand typing. It would have been even better if there was an additional battery inside it to power you on, but no such luck. There's a great carrying case you can get for your newly-bought Samsung Galaxy Tab 10.1 (or 8.9). It does add to its weight and thickness, mind you, but sure looks nice.